Would you survive a nuclear bomb? This site has the answer. While the threat of a nuclear holocaust isn’t quite the day-to-day danger it once was, the bombs themselves are just as much of a threat – so would you survive a nearby attack? 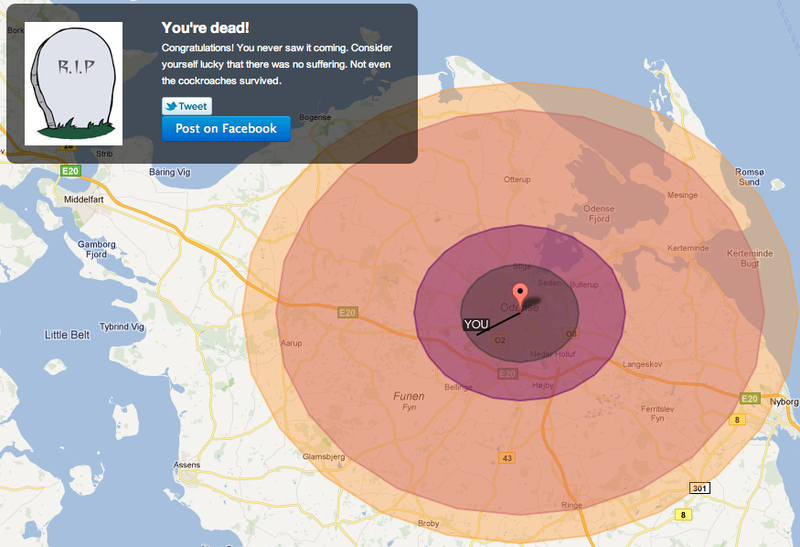 Would I Survive A Nuke is a site designed to give you the answer. First, set your location, then choose the aggressiveness of the attack, the number of nearby cities to be targeted, and the size of the bomb (from an 18 kiloton ‘Fatman’ to a 50 megaton ‘Tsar Bomba’) – then it’s time to find out whether you’d live or not. Personally, I ended up with first degree burns but I’m not sure that counts as lucky. If you manage to survive, select the ‘Dinosaur-ending meteor’ option for instant doom. It may be five minutes of fun, but Would I Survive A Nuke also does a useful job of reminding us of the horrors of nuclear war. Now I’m off for a refresher on how to protect and survive. ➤ Would I Survive A Nuke?